Getting to Madarao Kogen is straightforward. After travelling from Tokyo to Iiyama (the city at the mountain base, pronounced ee-yama) foreign visitors usually stay in or around Madarao Mountain Resort which is about 15-30 minutes by taxi or bus from Iiyama Station. Please note that there are no public shuttle buses around Madarao and Tangram. From the lower part of Madarao resort it takes about ten minutes to get to the slopes so please check when booking your accommodation. However, many of the Madarao hotels are happy to shuttle their guests for free. 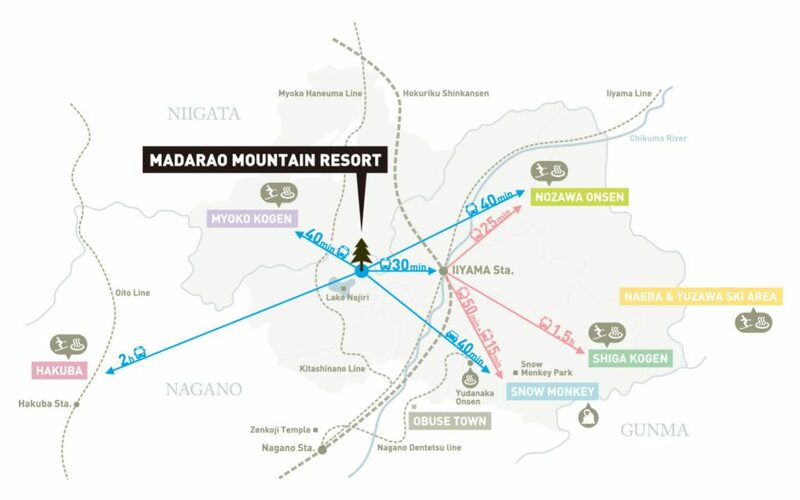 Getting to Madarao Kogen: Where is Madarao? Madarao Kogen is located right on the border of Nagano and Niigata Prefecture on the main island of Honshu. In fact you can ski both prefectures within the same resort area. The Madarao Kogen area is easily accessed from both international airports in Tokyo (Narita & Haneda) by shinkansen (bullet train), airport shuttle, taxi, rental car or bus. The total travel time from Tokyo to Madarao Kogen is usually between three to five hours. Okay, so now you know where Madarao Kogen is. How do you get to Madarao Kogen from Tokyo? Make your way from Narita Airport to either Ueno or Tokyo Stations. You can catch the Narita Express train to JR Tokyo Station (3,000 yen) or the Keisei Skyliner (2,400 yen) or express (1,200 yen) to Keisei Ueno Station. Use this very useful link to find train time tables and fares to Madarao-Kogen. Once in Tokyo/Ueno, get on a Hokuriku or Nagano shinkansen headed for Nagano or Kanazawa. Visitors can buy a ticket at the airport through to Nagano, Iiyama or JoetsuMyoko if using the Narita Express (also known as N’Ex). Take the Tokyo Monorail (13-26 minutes, 490 yen) to Hamamatsucho Station. From there transfer to the JR Yamanote or JR Keihin-Tohoku Line to Tokyo Station. Alternatively, limousine buses depart from Haneda Airport to Tokyo Station every 30 to 60 minutes (20 minutes, 580 yen). This is the most popular way of getting to Madarao from Tokyo. The journey itself will usually take less than two hours (Tokyo – Iiyama) and 3-4 hours total depending on transfer times in Tokyo and Iiyama/Nagano. To check train timetable, please click the links below. Once at Iiyama visitors can take a bus or taxi from the front of the station (see below). Iiyama to Madarao note – some Madarao hotels do collect guests from the station but it’s best to pre-book. It’s important to note that some services terminate in Nagano (Nagano Shinkansen) and other services may not stop at Iiyama. 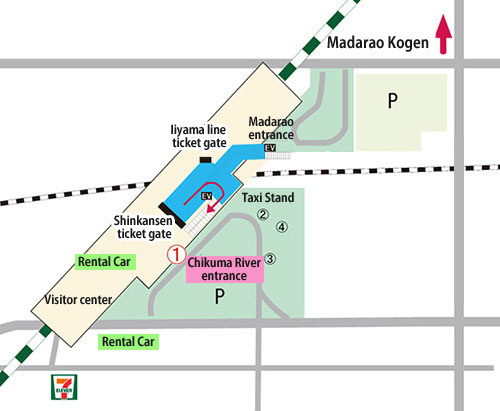 If stopping in Nagano exit via the shinkansen transfer gate (see below) and change trains to the local JR Iiyama line. From Nagano Station to Iiyama Station it is about 45 minutes. This journey is covered by by your JR Pass (if you have one). At Iiyama transfer to bus or taxi. Alternatively (in winter) there is a highway bus from Nagano station two times a day to Madarao which takes about 70 minutes. Sunshine Tours has a morning bus (6.50am – ¥4,500 one way) and an evening bus (11.00pm – ¥5,000 one way). Both leave from Shinjuku. The latter will suit those arriving on late flights. Travex offers a Madarao morning shuttle service costing ¥5,500 one way or ¥9,000 return. Pick ups are in Shinjuku and Ikebukuro. Don’t want the hassle of carrying bags, herding children and changing trains? Let us organise a taxi transfer for getting to Madarao Kogen. A shared taxi van ride right to the hotel door (ex Haneda or Narita airports) is 17,900 one way, per adult/teen (70% for U/12) including luggage allowance, taxes and name sign at the airport. Taxis usually depart the airport within 30-90 minutes of your arrival time. Sometimes these are full, other times it may be yourselves only. Contact us for more details. For medium-large groups we can help organise a direct private transfer from the airport to Madarao (or return) at reasonable cost. This chartered direct service from the Tokyo airport to your Madarao hotel would be between 129,000-199,000 each way depending on numbers & bus type. Contact us for more details. Taxi/charter journeys to Madaro will usually take 4-5 hours depending on traffic and weather conditions. Comfort stops are included. 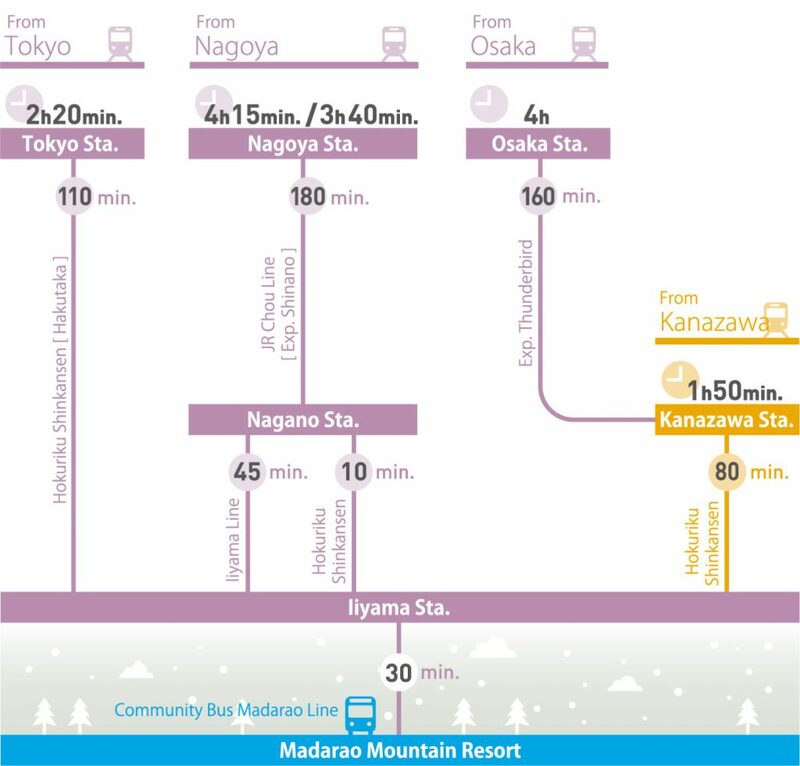 Nagano Snow Shuttle is your most convenient way to transfer Tokyo to Madarao. 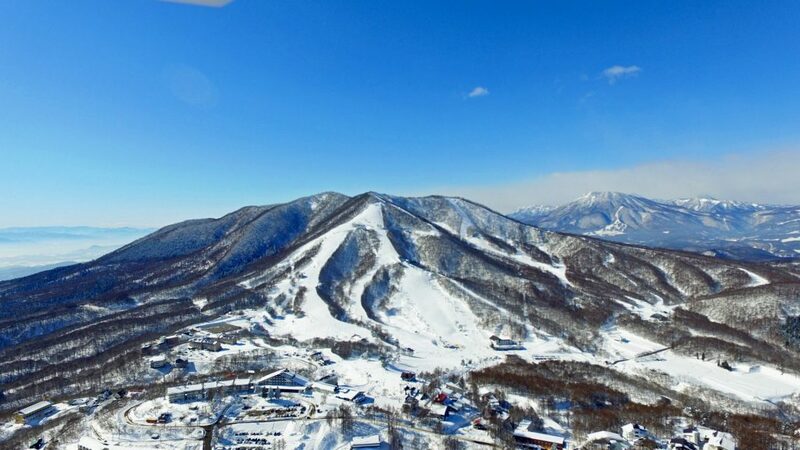 The service offers up to five shuttles daily to Madarao from Narita Airport, Haneda Airport and three other nearby ski resorts – Myoko, Hakuba, Nozawa Onsen and Shiga Kogen. Schedules are as follows. There is an overnight bus from Nagano to/from Narita Airport (via Matsumoto, Ueno and Tokyo Disneyland). The cost is 6,900. From Nagano catch the train to Iiyama Station or bus to Madarao (see above). This service is especially useful if arriving late or leaving early. See the Alpico Bus website for full details. There is a Nozawa Onsen – Madarao Kogen shuttle operating each winter (28 December 2018 – 3rd March 2019). Reservations are not needed and you can pay on the bus. Full details and timetables are available from your Madarao accommodation. There are two daily return shuttles Madarao to Myoko Akakura Onsen. The Akakura (Myoko) – Madarao Ski Shuttle bus will operate from December 23rd 2018 – March 4th 2019. Full details and timetables are available from your Madarao accommodation. The cost for the daily shuttles Madarao – Tangram – Myokokogen – Akakura is 1,000 yen one way. Pay by cash when boarding. Summary: This page helps visitors find out how to get from Tokyo to Madarao Kogen plus the basic question, “Where is Madarao?”. One can also discover the best ways for getting to Madarao Kogen / Madarao access or how to get from Myoko to Madarao and how to get from Nozawa Onsen to Madarao.